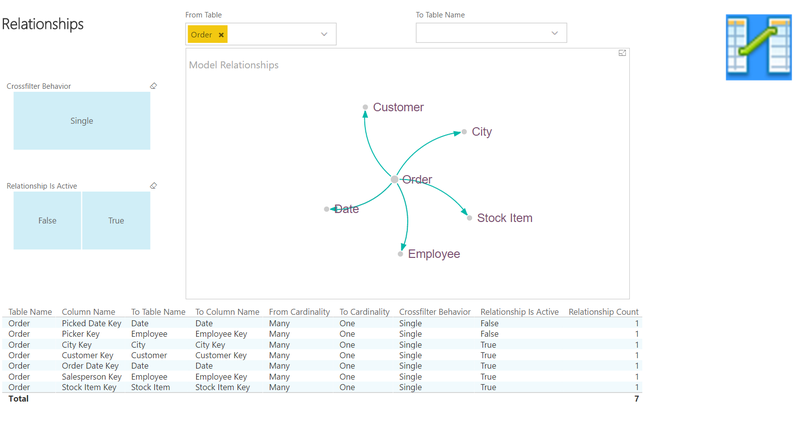 A while back I created the Tabular Model Documenter Power BI model that can connect to your SSAS Tabular or Power BI model and display metadata about the model to help you see relationships, calculations, source queries, and more. I had been meaning to turn it into a parameterized template since templates became available and just finally got around to it. You can now download the PBIT file here. Note: This works for SSAS 2016/compatibility level 1200, but may need some adjustments for Azure AS and SSAS 2017. When you open it, you’ll need to fill in the instance and database name, then allow some native queries to run. Then you will have your tabular model documented for you without a lot of manual effort. For more info on how to use the Tabular Model Documenter, see the original post. A client wanted to upgrade their SSAS model to SSAS 2016 to take advantage of some of the features of the new level 1200 compatibility model. But they weren’t yet ready to upgrade their SSIS server from SQL 2014. This presented a problem because they had been using the Analysis Services Processing Task to process their tabular model nightly. This processing task in SSIS 2014 uses the old Analysis Management Objects, which aren’t compatible with the new SSAS tabular models. The reason for keeping SSAS processing in an SSIS package was because it kept consistent logging throughout their data refresh process. So we set out to find another solution. Just pasting the JSON to process the model into an Analysis Services Execute DDL Task didn’t work. It returned the error “DDL is not valid”. I asked around and received a couple of solutions that worked. Option 1 (my less preferred option): Create an OLEDB connection manager (rather than MSOLAP) and use an Execute SQL Task. You can set up an OLE DB connection that looks like the below. Create a new connection manager and choose the OLE DB connection manager type. 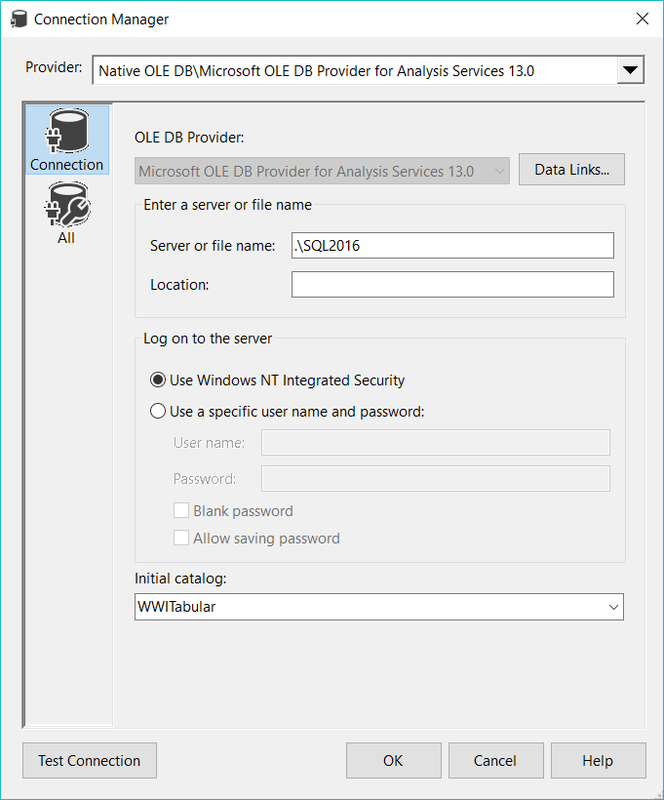 Change the provider to Microsoft OLE DB Provider for Analysis Service 13.0 and fill in your connection information. Drag in an Execute SQL task, use the previously defined connection manager and paste in the JSON. This works just fine, but feels a bit too much like a workaround rather than a solid solution to me. Drag in an Analysis Services Execute DDL task. 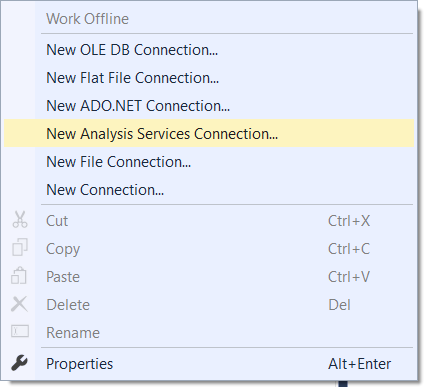 Create a new connection manager by choosing New Analysis Services Connection. Use that connection manager in the AS Execute DDL task. We can use the same JSON from earlier and wrap it in XMLA as shown below. The XMLA/JSON command can be a direct source statement or placed in a variable and referenced from the task. To test that the model is successfully processed, you can execute the SSIS task or package and then run the following query against the DMV. So if you are caught between versions in SSIS and SSAS, do not despair. 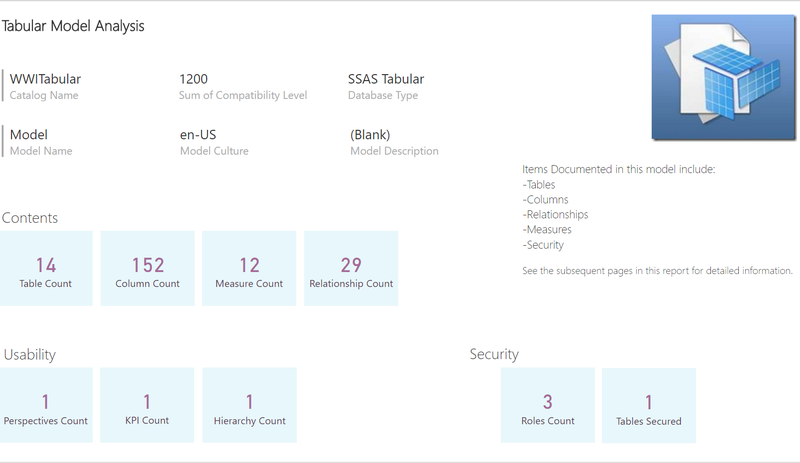 You can still process your new SSAS Tabular model from an SSIS package. This is just a quick note (since I apparently forgot and was puzzled for a moment) that the MDSCHEMA_CUBES DMV shows you LAST_DATA_UPDATE (last processed date) in UTC, regardless of the timezone of your SSAS Server. Marco Russo has a great post about all the ways you can get your SSAS model’s last processed date, which does note that the DMV returns the datetime in UTC. The datetime returned by this query is in UTC. My query returns 9/19/2016 7:43:03 PM. If I go into the properties of my SSAS database, I can see this same info, but the timezone conversion has already been done for me (this server is in Central time zone). So if you have ever gotten results that seem to be in the future or wondered why these two times do not match, it’s probably due to time zone conversion. I was working on a SSAS Tabular 2016 solution for a project for which I had no data (an empty data model, but no data). I was not in control of the source data warehouse, so I couldn’t change what I had, but I needed to get started. So I went about creating a date dimension with a fiscal calendar entirely in DAX. There are several scripts out there to create a date dimension. Although there are many nice alternatives for Power BI that are built in M or a combination of M and DAX, I haven’t seen many full date dimensions with a fiscal calendar just using DAX. I’ll explain some of the DAX calculations below, but I put the TMSL/JSON in Gist so you can easily paste into a SSAS 2016 Tabular project. The JSON has the added benefit of retaining data types, formatting, hidden, and sort by properties. The fiscal calendar assumes calendar months with the fiscal calendar shifted by some number of months. It also assumes that the fiscal year is ahead of the calendar year. That is, fiscal year 2017 starts in the first day of some month in 2016. In my example script, the fiscal year starts in October. If you have some 4-4-5, 4-5-4, or other calendar, the fiscal calendar calculations in this script won’t help you. Right click on the Model.bim file in the Solution Explorer and choose View Code. If you have at least one table in the model already, locate the end of the definition of the previous table, inside the table array. Add a comma after the end curly brace for the previous table. Paste the JSON/TMSL from my Gist. Right click on Model.Bim and choose View Designer. The current date range goes from 1 Jan 2010 through 31 Dec 2025. This field represents the calendar month number in which the fiscal year begins. If your fiscal calendar begins in July, you’ll want to change the 10 to 7. You shouldn’t have to adjust anything else in the date dimension to get correct values. I used the FORMAT() function to get a lot of the calendar fields as well as the [DateKey] field. Many of the fiscal calendar fields use the EDATE() to shift date calculations to the correct month. The [Fiscal Year Nbr] field uses the [Fiscal Year Month Begin] field to ensure the correct year is shown. I also like to include the beginning and end dates for month, quarter, and year. DAX has a nice EOMONTH() function to get the end of the month now. There are multiple ways to get end of quarter. I used an if statement. You could also use SWITCH(). I also included begin and end dates for the fiscal quarter and year (end of month is the same since my calendar assumes fiscal months are calendar months). The EOMONTH() function allows you to shift forward or backward from the current selected month. 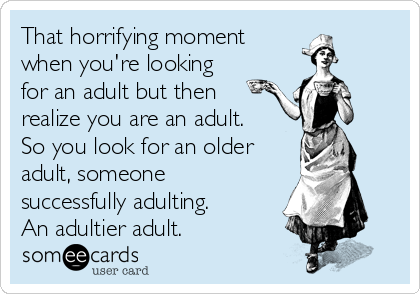 For the end of the fiscal year, I went to the beginning of the next fiscal year, subtracted a month, and then found the end of that month. The end of fiscal quarter calculation follows similar logic get the month that begins the next quarter and subtract one day.